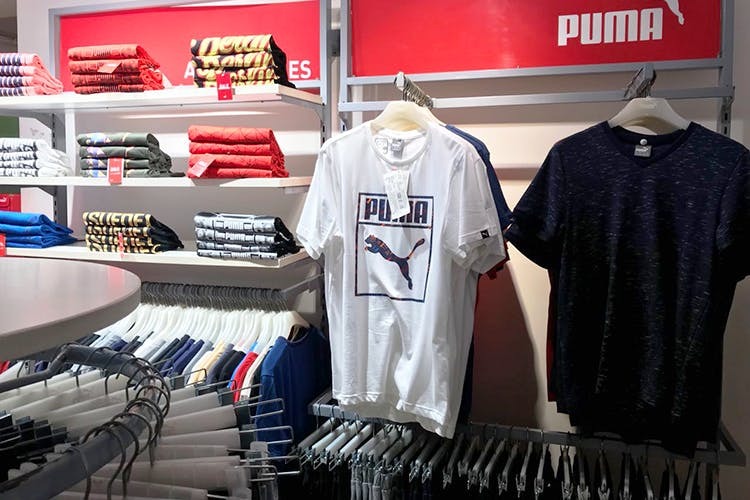 If it’s athleisure and sports shoes that you are looking for, head to the Puma Factory Outlet in HSR Layout. They offer year-round discounts and seasonal deals on all their merch! Puma’s factory outlet in HSR Layout has got everything that anyone would need when it comes to sporting goods. Joining a gym? Pick up duffel bags, trainers, sweatbands, socks, and gym wear. Or if it’s the marathon that you are planning to run, pick up running shoes, shorts, and sweatshirts. The best part? Everything comes for a discount of about 40 per cent off, plus you get deals and offers. The ground floor of the store is dedicated to men’s sports shoes, accessories such as bags, socks, sweatbands, shin guards, and water bottles, and apparel. The apparel section is mostly old season’s collections and includes sweatshirts, running tees, performance wear, and tracksuits. The first floor is a mix of women’s wear and men’s wear with women’s footwear. It goes without saying that the factory outlet also stocks up plenty of casual and street-ready apparel, footwear and accessories. Although they are again last season (or even older), the fact that they are on discount should be enough to make you want to stock up a couple of pairs. This writer doesn’t mind, in fact, he’s planning on getting a few high-tops and slip ons. You can score plenty of shorts and tees with designs on them. Plus, plenty of polos in lime green and navy blue that most dads would approve of. Or even boyfriends who think polos are something of a semi-formal wear. Oh, Arsenal fans, tough luck in scoring jerseys, but we did spot jackets and football. Don't go expecting to score latest and in-trend merch. Everything here is at least a season old. Also, we hardly spotted any hoodies or jackets, or even pull overs, but we hear the stocks keep coming and going. Maybe you will be lucky.